There is a sentence in Still Writing in which I explain that I have not, nor have I ever been joyful. Modestly happy, yes. Content, certainly. But joy? Not so much. That sentence happens to be in a passage that I’ve been reading aloud at some bookstore appearances. And each time I get to that line, it strikes me as no longer true. I am joyful right now. Even on this turbulent flight, in my cramped seat, hungry, run-down, tired, I am filled with this unfamiliar abundance. This slightly uncomfortable, brimming excitement that it’s difficult to contain. Life seldom grants us our dreams as we dream them. Life rarely shocks us with good news. We do our work. We labor alone. We follow the line or words, one at a time, like breadcrumbs that might, just might, lead us out of the forest. We expect nothing. Or perhaps I should speak more personally, more directly. I have spent my writing life practicing the art –– to paraphrase Colette –– of waiting. I have waited between books. I have waited for books to emerge. There has been no master plan. At times I have longed for a plan. I have felt a crisis of identity. Am I a novelist? A memoirist? An insult was once passed along to me (a questionable act, disguised as being helpful): Dani has only one subject. It stung. It stayed. But secretly, I wondered if it was true. Was my subject myself? And if my subject was myself, how might I take that singular, tiny, idiosyncratic self, and make it larger –– much larger –– so that I might have something to say that would resonate with others? When I wrote Devotion I had no role models. What literary novelist swerves into spiritual territory? I was told I was making a mistake. That I ought to keep writing fiction, where I was starting to make a name for myself. But –– obstinate, willful, and most of all unable to pick and choose my obsessions –– I traveled to this strange new land. There were lessons I needed to learn. Questions I longed to address. These questions haunted me. They burned bright. I spent a life-altering couple of years writing Devotion, and when I finished the book, the path did not end. There were more questions. More lessons. I hope there always will be. When I got the call inviting me to be Oprah’s guest on Super Soul Sunday, my initial response was disbelief. The next morning, I thought I had dreamed it –– literally. In the weeks that followed, I kept thinking it would somehow be taken away from me. I mean, why wouldn’t it? How could such a miraculous, beautiful, fortunate thing happen to me –– to me? 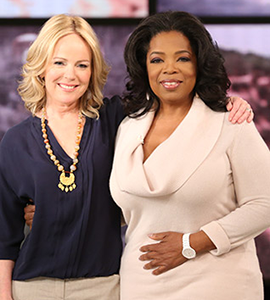 But in the weeks leading up to my conversation with Oprah, something interesting happened. I began to grow clearer and clearer about what I needed to do. I didn’t need to think. I didn’t need to rehearse. Rather, I needed to grow very quiet and centered, and arrive in Chicago for that conversation with an open heart, a clear mind, and a joyful embrace of the extraordinary opportunity. And on that day, when one of the producers put her arm around me and said: “All you have to do is be yourself,” the words went through me like a shock. It has been a lifetime, people. A lifetime of running away and returning to myself like a child playing tag with a tree. And, like a stately old tree, roots spread deep in the earth, my best self –– all of our best selves –– has always been there, ready, silent, observing, waiting. It’s hard work to be ourselves. Every word I said was true.